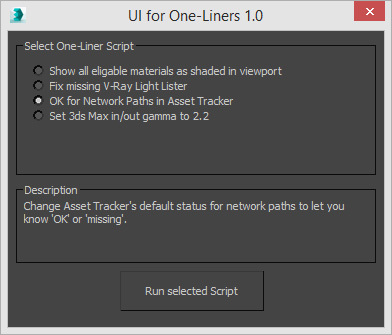 Have you ever wanted a simple interface for those obscure or lost commands in 3ds MAX? This is a simple User Interface for some of those one-liners that you may need from time to time. For now there are 4 commands, but more will be added with time. Extract the zip file and save the “UI4OneLiners.mse” file somewhere in a central location where everybody can access it, for example “\\YourServerName\Library\Scripts\”. To run the script, drop it into a 3ds Max viewport or in the menu under “MAXScript” > “Run Script…”. Remember to make backups of your scenes, use the script at your own risk and report any bugs.